I started with simple JSP and Servlet Application for a common functionality forums. I first decided to do one db access class, that will hold the connection and some common functions so each time i dont need to write those repeat lines for open connection and close. I know I am somewhat fresher to this concept but trying to improve my knowledge in the concepts. Google helped me find a SVN repo out there that had the 3 jars I needed, and after loading them into the correct folder. Eclipse stopped throwing errors. If you’re looking for the files I used, you can find them here:http://lportal.svn.sourceforge.net/viewvc/lportal/portal/trunk/lib/development/. I determined that quercus.jar, resin_util.jar, and script-10.jar were needed for Quercus to do its thing correctly… at least that’s what I think. Drop them in the WEB_INF/lib folder and you should be all set. Now the actual process starts. I don’t know if any order is important here, but I put the php servlet first, followed by the default servlet, followed by the php servlet-mapping, followed by the default servlet-mapping. Next to create one php.ini file in war/WEB-INF folder. Currently i kept it blank. I deployed on app engine, and there too it started smoothly. First thing you need is google cloud sql account You can apply for limited preview HERE. Once your account is approved (within 4-5 days). you will receive an activation email to activate the account. Activate with necessary details and in API console you will find the fresh new google cloud sql service is waiting for you. 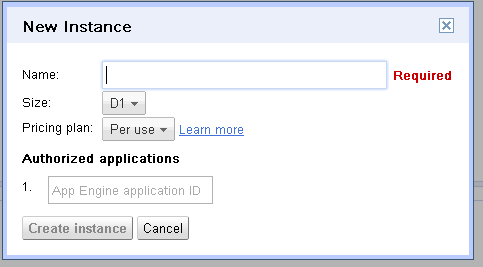 App id is you Google App Engine (GAE) application id, If you dont have one you can create it HERE. Now you can proceed with actual development. I started with Java. You can use the google cloud sql with GAE app. To start developing GAE app I preferred the ECLIPSE and you need the google plugin. Will explain how to create the project for google app engine in later posts. and thats it.. you are done. Proceed with rest things as regular JDBC to connect to cloud sql.